When it gets windy on the course do you get excited or nervous? If you miss a fairway and need to punch one back, do you feel confident with your punch shots? Each day and course bring new conditions and shots that are required. If you can control your golf ball trajectory you can play in any weather and have more shots in your arsenal. With just a few simple tweaks to your swing, you can hit it lower and higher relatively easily. Keep reading to learn how to control your golf ball trajectory. 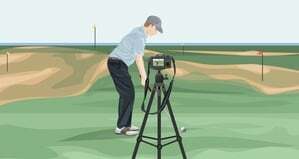 Most players accept their golf ball trajectory for “how it always has been.” But if your golf ball is going too high or low it can make the game even harder. If you hit the ball too high it makes playing in the wind a miserable experience. 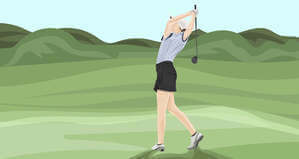 You also might struggle keeping the ball on the greens with short irons and wedges making scoring very difficult. But, if you hit it with too low of a trajectory you have the opposite problems. Hitting it low might help for the wind but on a normal day you might miss greens long and get into trouble. If you can learn how to control your trajectory you can hit more fairways and give yourself shorter putts for pars and birdies. Plus, if the weather does get bad, other players will collapse while your game will stay consistent. 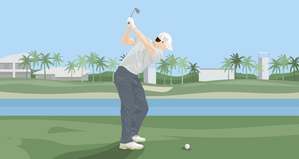 Knowing how to hit all the different types of shots (fades and draws) in practice can lead to saving strokes all over the course. As the old saying goes, “When it is breezy, swing easy.” And it’s true. 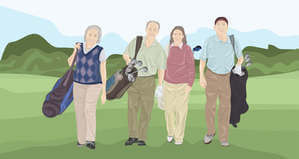 When you need to hit the ball lower most golfers do several things wrong. The first is positioning the ball too far back in their stance. This won’t help you hit the ball lower and might actually make you hit the ball higher! Because when the ball is positioned too far back in your stance your swing gets steep. This will cause you to hit down on the ball which forces it up quickly. This also results in a ball with a ton of backspin which is exactly what you don’t want when trying to hit a low ball. Instead, listen to the old adage, take an extra club and swing easy. Going up one or two more clubs and swinging slightly slower (don’t think slow, think smooth) will help you keep the ball low. Beginning with your stance, make sure have a wide enough stance so that you can have a stable base. You want a stable base because you won’t be taking a full swing and want enough stability to promote a lower finish. Once you are setup, choke up on the grip as this will promote a more compact swing. 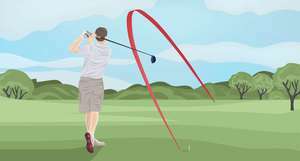 It will also help the ball travel through the wind with a more piercing trajectory. While you don’t want the ball off the back of your right foot, it should be back one inch from your normal position. Lastly, adjust your shoulder tilt by dropping front shoulder down slightly. The best way to keep the ball low is to think about finishing low. Try not to follow through with the club any higher than your ribcage. Swinging high promotes a high ball flight which I’ll discuss in the next section. Finally, you want to feel like you are only taking it halfway back and halfway through. Don’t think about hitting it hard, think about swinging smooth. Now that you can hit it low, you also need to learn the opposite as well. 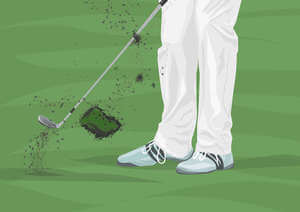 Here’s how to hit the golf ball higher. When you need to hit the ball higher it’s nearly the exact opposite as hitting the ball low. Swinging fast will increase the spin and increase the trajectory. When you swing down on the ball the more it will go up. Make your swing steeper to make the ball go up faster. 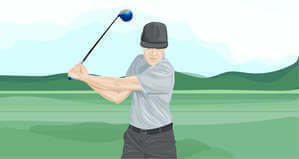 Instead of clubbing down like hitting into the wind you need to take one club less as you are swinging faster. 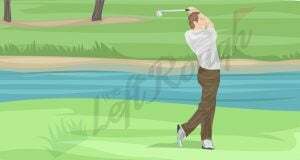 Also, remember that you need to make a divot to make the ball go higher! Beginning with your stance, make sure have a wide enough stance so that you can have a stable base. You will also want more of your weight on your left side (if you’re a right-handed player) to promote hitting down on the ball. Next, don’t choke up on the club at all, you want maximum length. Adjust your ball position so it is more forward in your stance and this will help get the ball higher. The only way this works is if you have your weight adjusted forward enough. Otherwise, with your weight back it could lead to hanging back and sculling shots. 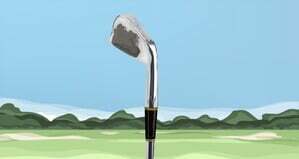 Also, tilt the shaft angle backward so that you don’t forward press the ball like you normally do with irons and wedges. Lastly, you want to adjust your shoulder tilt by dropping back shoulder down slightly. 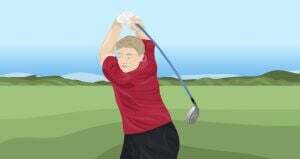 Swing normally on your backswing but on the follow through think about finishing high to let it fly! In addition to hitting a draw on command or playing a fade, having the ability to work the ball high or low is a valuable tool to have your in arsenal. If you had to choose one type of shot I would recommend playing a high ball flight if you could choose. It’s much easier for high ball hitters to hit it low than a low ball player trying to fly it high. Higher shots are great for most courses in the United States that have harder green surfaces and tougher bunkers around the green. A high shot can land soft and give you more chances for pars and birdies. Try out these tips the next time you’re practicing so you can learn how to control your trajectory for your next round.